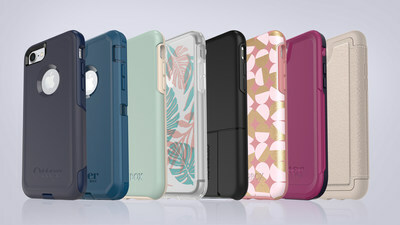 "OtterBox is proud to be the only case company that's protected every single iPhone," said OtterBox CEO Jim Parke. "While other products have come and gone, OtterBox has stood the tests of time and protected every single generation of iPhone, so you can count on us to keep iPhone 8, iPhone 8 Plus and iPhone X safe from the hazards that life throws your way." Each iPhone 8, iPhone 8 Plus and iPhone X case design undergoes a minimum of 24 tests across more than 238 hours to earn the OtterBox Certified Drop+ Protection seal. These tests ensure lasting protection from drops, bumps, scratches and dings. The fashionable Symmetry Series is sleek with a raised, beveled edge that provides extra protection for the touchscreen during facedown drops. Available in classic solids, trendy graphics, fully clear and clear graphics, it's the perfect fashion statement. Pursuit Series guards against drop, dust, dirt and snow intrusion, perfect for an outdoor adventure or average day in the office.2 This two-piece case snaps around each device for a perfect fit. The open-face design seals directly to the display and the case includes an optional lanyard. Defender Series is the original protective case for iPhone with 10 years of design and development behind it. 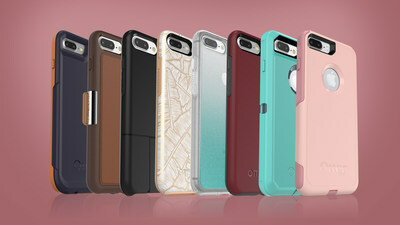 The rugged multi-layer case features a shell and outer slipcover to absorb and dissipate shock. Symmetry Series, Pursuit Series, Defender Series, Commuter Series, uniVERSE Case System, Strada Series Folio and Alpha Glass screen guards are available now for iPhone 8 and iPhone 8 Plus.3 These cases, available in exciting new colors and designs, are also compatible with iPhone 7 and iPhone 7 Plus. Cases for iPhone X are coming soon and include Symmetry Series, Pursuit Series, Defender Series, Commuter Series and Strada Series Folio. For more information, visit otterbox.com. 2 OtterBox Pursuit Series case is NOT protective against water. Will provide added protection against bumps, drops, shock, dust, dirt and snow. 3 Symmetry Series, Defender Series, Commuter Series uniVERSE Case System and Strada Series are NOT protective against water. Will provide added protection against drops and shock.